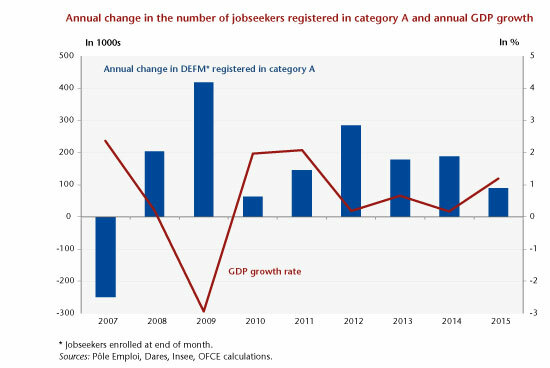 Since June 2015, the number of job seekers at the end of the month (the number of “DEFM”, in French) in Category A registered with Pôle Emploi has swung from month to month, rising and falling. This high volatility, which reflects a sluggish labour market in which there is insufficient job creation to make a long-term reduction in unemployment, is directly related to the sluggish growth in the French economy overall. So after a relatively favourable November 2015 (15,000 DEFM fewer in category A), December once again saw an increase in the number of unemployed (+15,800), offsetting the previous month’s fall. In addition, for the first time since May 2015, all age groups experienced an increase in the number of category A DEFM in December. Ultimately, the number of jobseekers registered in category A with the Pôle Emploi job center increased for the eighth consecutive year in metropolitan France. With the return of higher growth, this increase has nevertheless been less than in previous years: +90,000 in 2015, versus +200,000 on average between 2011 and 2014. The increase has massively affected job seekers aged 50 and over (+69,000 in 2015), while the numbers under age 25 were down (22,000 fewer in 2015). The implementation of successive pension reforms (2003, 2010), coupled with the elimination of exemptions on job-seeking by seniors, has led to a longer duration of economic activity and to putting off the age of retirement. In a context of weak growth, the rise in the employment rate for seniors has been insufficient to absorb the increase in the workforce for that age group, with a consequent increase in unemployment of those over age 50. The decreasing number of unemployed young people is due to two main factors. First, the employment policies enacted since 2013 have targeted youth in particular through the Jobs of the future (emplois d’avenir) programme. Second, the low job creation in the market sector is mainly taking the form of temporary jobs (fixed-term CDD contracts, temping), a type of employment in which young people are heavily represented (34.2% of young people in employment are on CDD contracts or temping versus 8.4% for other age groups). This development can be compared to the observed increase in categories B and C (+170,000 in 2015 against 97,000 on average between 2011 and 2014). Thus, while some return to work has been observed, this has not resulted in exits from unemployment as measured by the job center, and has not led to halting the continuing rise in the number of long-term unemployed (+9.5% in a year). The year 2015 therefore did not see a reversal in the unemployment curve. Recall that it takes a GDP growth rate of over 1.4% to create enough jobs to begin to roll back unemployment, and only an extended return to growth over that threshold would be sufficient to lead to a sustained drop in the number of category A jobseekers enrolled in the job center. ← Intergenerational inequality in four large EU countries: Does one model fit all?